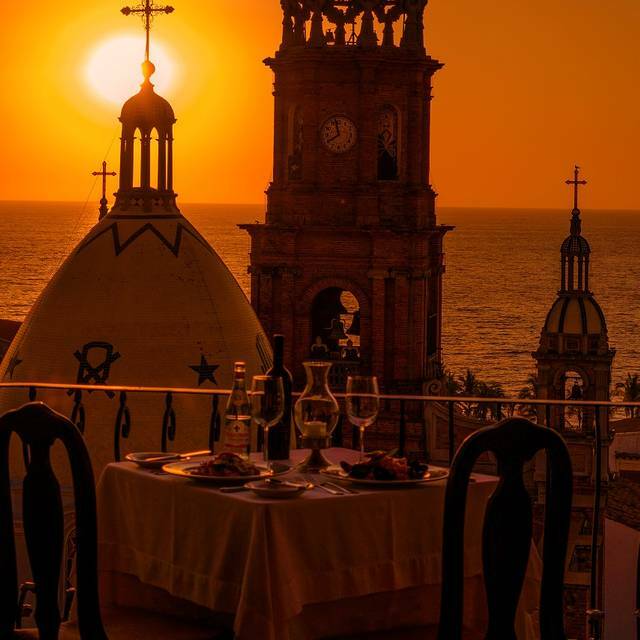 Comida Italiana en un elegante espacio abierto con vista panorámica al mar, la bahía y la hermosa Iglesia de Guadalupe. 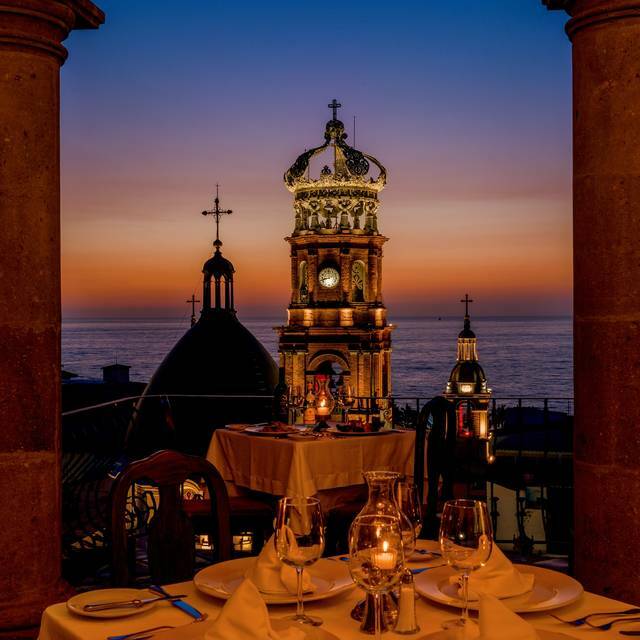 Best restaurant we experienced in PV! Amazing staff, food and view! The ambiance was wonderful......we had the chilean see bass with couscous......delicious.....definitely worth enjoying again. Excellent location, ambiance, food and service. Highly recommend this restaurant. One of our favorites!! Lamb chops are wonderful!! Such rich history here! This was our second time dining at La Cappella, always superb. The view, the service, the food, the string trio walking around playing great music-there is really nothing that could top it. For anyone looking for a special place to go for a special occasion or just because this restaurant cannot be beaten. You are always very well looked after. Can’t wait to return again. Fabulous evening! Loved my experience there! Outstanding! I can not say enough wonderful comments on this brunch buffet. Beautiful open air space. Every item eaten delicious. We love this place for Sunday brunch. The staff are amazing, the view and ambiance are spectacular. The chief, the violinist are wonderful as well. Absolutely stunning space. Gracious service, excellent food. The scenery is amazing and the violinists just added to the whole experience. I highly recommend. We appreciate so much. . We went at your restaurant 3 times in the same month, and we recommend at all our friends. The music is so fantastic, the food, the ambiance. It is a beautiful place. Birthday. My lobster was mush. Very disappointing. Especially since in Feb my family and I all had had it. We Enjoy visiting La Capella a few times durioour stay in PV. The Violinist were amazing the evening we dined. The food is absolutely beautiful and Delicious! The staff is Lovely! A must when in Puerto Vallarta! Bien Provecho or Bon appetitive! The Osso bucco needed more spice like red wine, nutmeg and oregano. The plate was too small for the large bone, perhaps a flatter China to show off the polenta dripped w the sauce. The Mayo sauce for the shrimp antipasto is embarrassing, surely another sauce will compliment the succulent shrimp. Focaccia cheese bread was too dense, maybe it’s a cheese bread not a focaccia. A plus for ambiance, music and service. Too bad the food was not up to par w the rest. Wonderful ambiance. Great views. Strolling violins were beautiful. good was excellent. Es un lugar mágico!!! 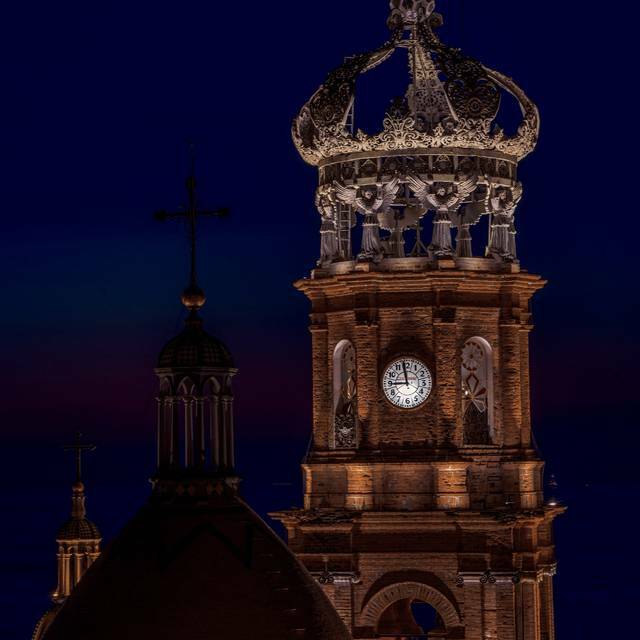 Para toda aquella persona que quiera darse cuenta por qué Vallarta es tan atractivo para el turista mundial, puede asistir a este lugar. La Capella is one of our favorite Italian restaurants for evening dining, but this was our first and last Sunday brunch at La Capella. Although we had heard incredible remarks about La Capella’s Sunday brunch, I liken it to a sub, sub standard Country club brunch. Service was non existent, we had to ask for drinks, employees were eating off of and out of the chaffing dishes on the buffet line (with bare hands and not even using utensils) and although they close at 2:00, at 1:20, the employees and hostess / manager were sitting down in the front entry way. When we arrived at 12:30 for our reservation most of the food was cold as the chafing dishes’s sternos had burnt out and we had to ask for sternos to be replaced and the food be warmed up. What a truly disappointing Sunday!!! Beautiful setting for Sundaybrunch. Every detail taken care of to make my visit a memorable experience. The decor, sunset and food were outstanding. The wine price list was somewhat over inflated. We always enjoy a visit to La Capella for An evening in PV! The Experience is full of senses! Sights Sounds Arromatic and The Sun Sets swoon! We celebrated our 30th anniversary at La Capella and had a very nice evening. Been there many times. Always awesome. Service from Aline was great. Amazing food. Best shrimp I have ever had. Trio of violinists a very nice touch. Service was impeccable. Worth every penny and more! The view is spectacular. The violinists are professionals. Their music enhances the dining experience. The physical space is elegant. 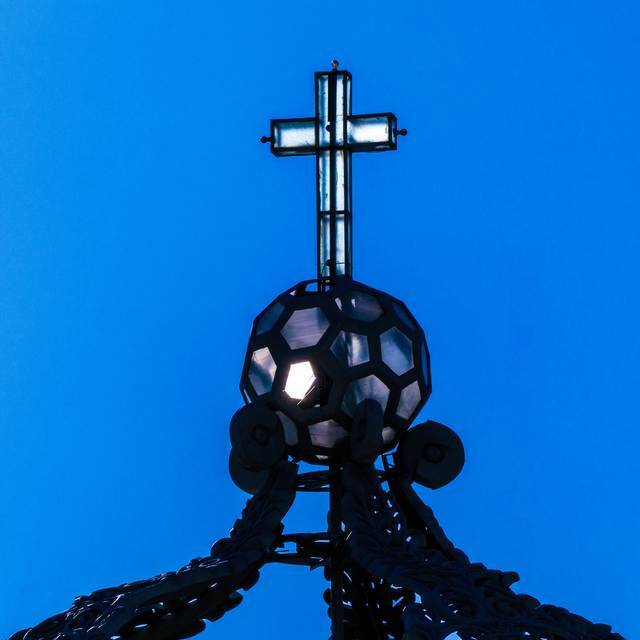 The prices are not bargain basement but the quality of the experience is worth every peso! I would recommend this place for its beauty. A PV highlight. Might have the best view of any restaurant in all the whole bay. Overlooking the church and the ocean. 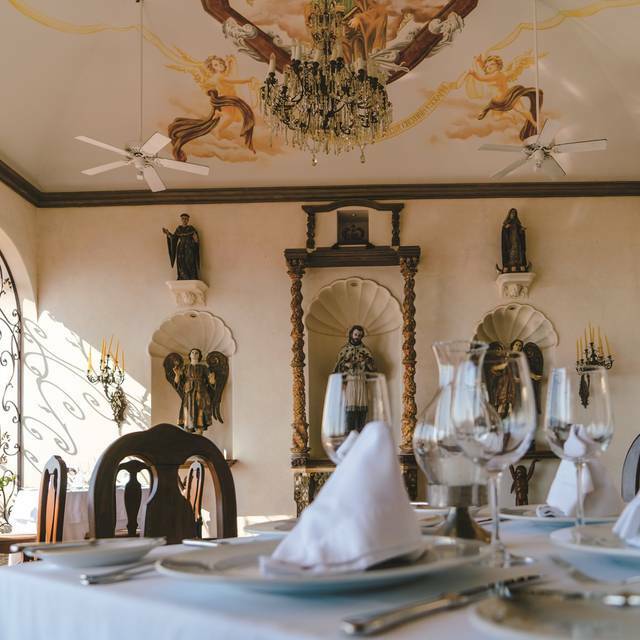 Elegantly decorated with Colonial Santos, arches and heavenly painted high ceiling. Just spectacular. We went late on a night at the tail-end of high season and we got one of the best seats in the house out on a small balcony like area and that made the evening magical. For tourists, this is a lovely view. Hard not to love PV sitting in this place. The wine list was great and offered many international selections. We had a nice light Italian red under $50 USD. The Caprise salad was a medium tower of tomatoes and mozzarella with a very nice dressing that kind of jelled on the plate for a pretty decoration. The chicken piccata was disappointing. Kind of geriatric. Slightest hit of lemon and a very small portion. Chicken medallions were well prepared, tender but flavorless and so tiny. How much does chicken cost??? I think this dish was over $30 USD. The accompanied linguine was under seasoned as well. The vegetables were good. This would be an easy dish to improve. The Coco Tiramisu had a nice coconut crust but was very sweet and the martini glass serving style made it feel like a parfait. $12 USD. Emanuel, the waiter was very friendly and enjoyable. 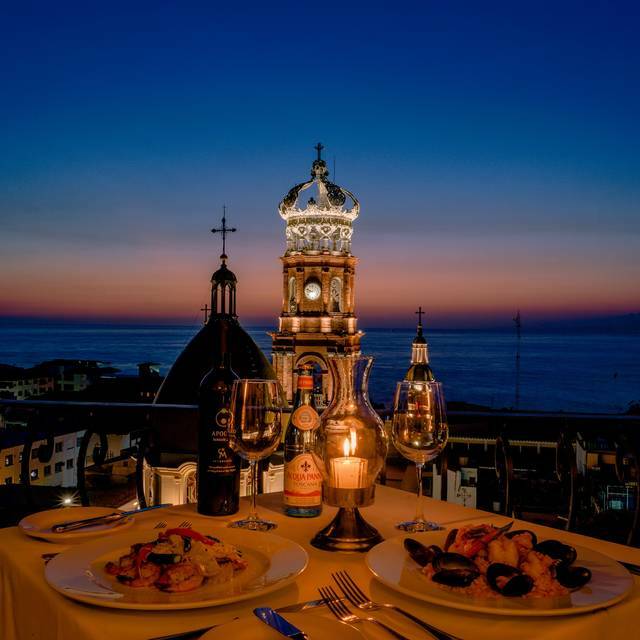 Go to this restaurant for the view and elegance. I recommend ordering dishes other than the ones we ate so offered details about each. I hear they have nice live music but it was not playing when we were there. Very nice for a romantic evening. 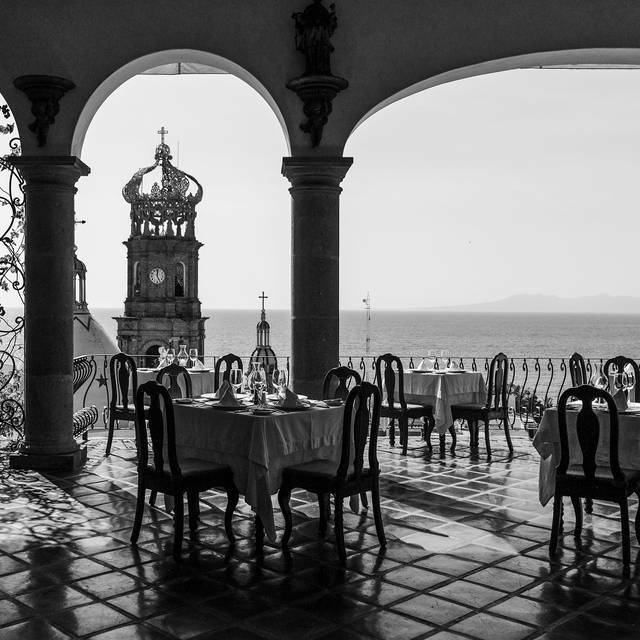 This Has become our favorite restaurant in Puerto Vallarta. The view is gorgeous! Service extraordinary. The live music consists of three talented violinists who play beautiful love songs to Gypsy music. Such FUN! Probably the most stunning restaurant venue I have ever seen. 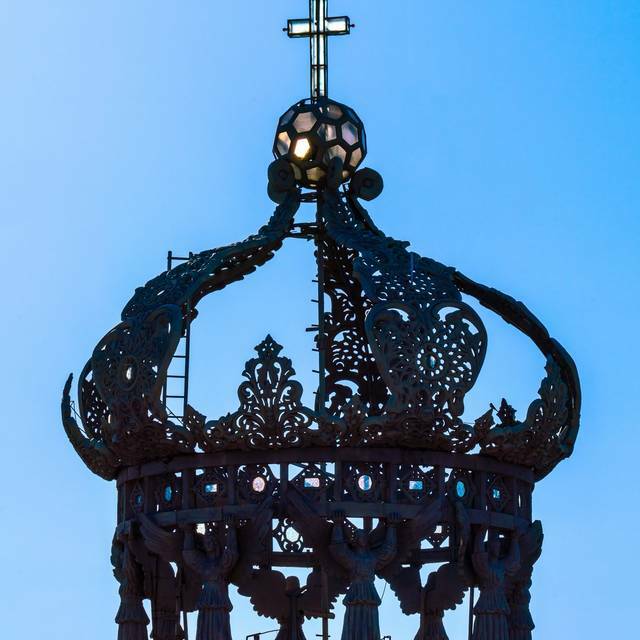 Beautiful room with direct view of the lit cathedral dome and gorgeous Banderas Bay. And the violinists were amazing. Food was great too, but it’s not important. Screw the cost too. Treat yourself to this beautiful place. You won’t regret it. We have been going to La Cappella for the Sunday brunch for several years. It is fabulous. Food and atmosphere are outstanding. The violin player is marvelous. The food is wonderful, but the view is unmatched. 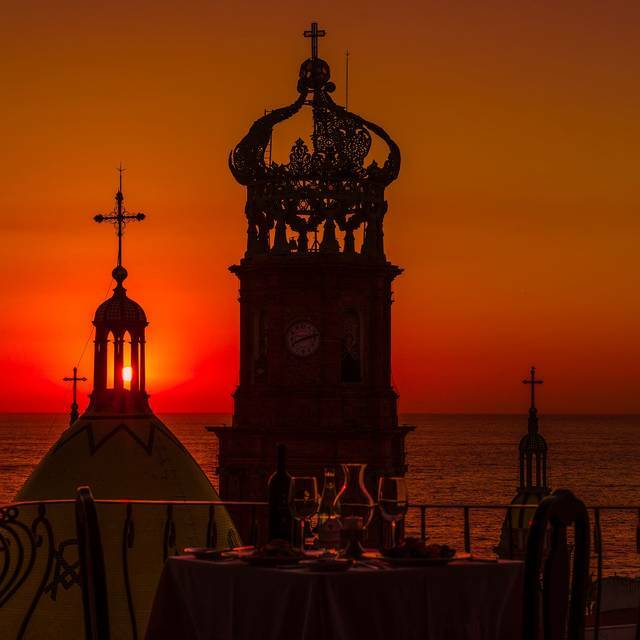 It’s hard to imagine a romantic spot to eat in Puerto Vallarta, and perhaps the world. The food and service was outstanding! Our waiter Manuel was outstanding! Fantastic view. Wonderful food. Excellent service. Delightful violin music. Will be back next year.